A root resection is needed in case of an infected root in a multi-root tooth. The infected root will be removed by your dentist, and you can keep your origin al teeth with the second root. In preparation of the resection session of root canal treatment will be proceeded. After root canal treatment we will need to explode your gum to make the infection visible. If any other treatment could help we will separate the infected root from the teeth and finally remove it. Before closing, the area will be cleaned and sterilised completely to avoid any further infection. 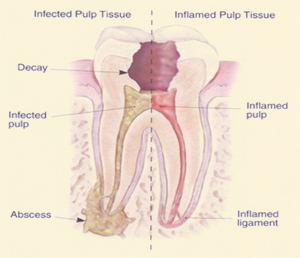 Root canal resection is made under local anaesthesia, so you would not feel any pain. For the first couple of months (2-5 months) you will have a temporary filling or crown. Stitches will be removed after a few days (7-10) and once your tooth is ready to receive the permanent filling or crown, we remove the temporary one. You can find more on endodontic resection on http://www.aae.org/patients/treatments-and-procedures/endodontic-surgery-explained.aspx. Our dental surgery prices are available on this page. If in doubt please call us to get some clarification about the issue.